This is the first of three volumes which together contain the complete range of Lord Rutherford’s scientific papers, incorporating in addition addresses, general lectures, letters to editors, accounts of his scientific work and personal recollections by friends and colleagues. 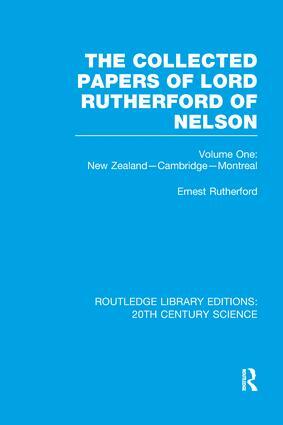 Volume one, first published in 1962, includes early papers written in New Zealand, at the Cavendish Laboratory and during the Montreal period (1894-1906), as well as an introduction to Rutherford’s early work by Sir Edward Appleton, and some reminiscences of his time in Canada by Professors H.L. Bronson and Otto Hahn. In each volume can be found photographs of Rutherford and his collaborators, multiple graphs, tables, diagrams and charts, and also pictures of the original apparatus which is of historic interest.